Listed under appraised value. Looking for a place to live happily ever after? For the whimsical at heart, 145 Washington Street is straight out of a fairy tale and is situated perfectly on Maria Sanchez Lake. The main house has over 3300 sq ft with four bedrooms and two and a half baths. Beautifully renovated with travertine tile and hand-scraped eucalyptus wide plank flooring, multiple imported hand-carved doors, butcher block countertops in the kitchen, and top of the line appliances. The outdoor living space includes three balconies and a lovely courtyard space that is perfect for entertaining. The third-floor master bedroom and bath are unfinished allowing you to personalize this enchanting sun-filled space to make it your own.The 1053 sq ft guest cottage is composed of a living/kitchenette area and half bath on the first floor, while the second floor offers two bedrooms and a full bath with washer/dryer and a spacious balcony overlooking the courtyard. These homes are very efficient to cool and heat due to complete coverage in icynene spray foam. The cottage would be a wonderful space for extra family or a great investment space if utilized as such. 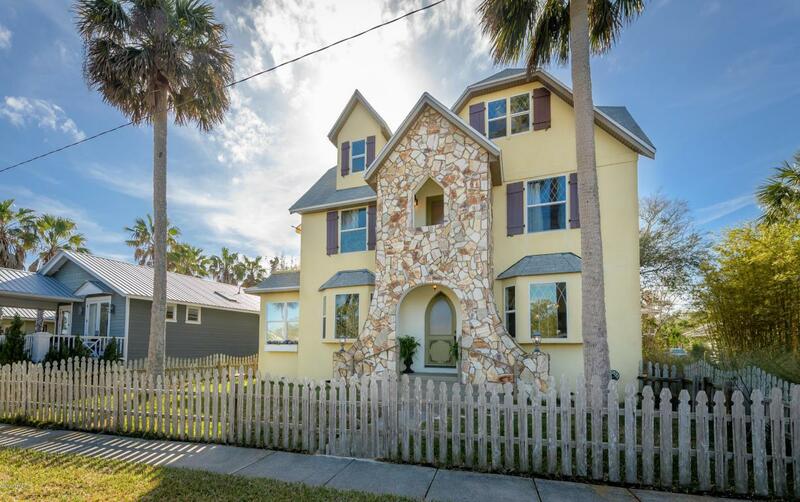 This extraordinary home is located in the heart of the nation's oldest city, where you can stroll to dining and shopping, or take a short drive to St. Augustine's beautiful beaches.